QINGDAO– ConocoPhillips China (COPC) today announced a cooperation in conjunction with Children’s HeartLink (CHL) to launch the “Creating Hope for Heart” medical training program at the Qingdao Women and Children’s Hospital (QWCH) that will help enhance the overall standard of medical treatment for children’s congenital heart disease (CHD) in East China. The Director of the Qingdao Municipal Health and Family Planning Commission, Yang Xixiang, the President of QWCH, Xing Quansheng, the president of COPC, Mark Wheeler, the Director of Corporate and Foundation Giving, Chandra Gruber and other representative leaders attended the announcement ceremony. COPC will provide CHL with funding in support of the program, which will focus on providing a series of international advanced training opportunities by which the hospital can enhance the expertise of its medical professionals in the pediatric CHD field. With COPC’s financial support, overseas medical professionals will be invited to Qingdao to provide on-site guidance for clinical scientific research, with the purpose of improving the treatment of CHD in children, and providing opportunities for QWCH’s medical professionals to study abroad, conduct remote consultations and participate in international academic programs. Regarding the collaboration, Mark Wheeler, COPC president, said, “ConocoPhillips has been in China for over 35 years and has developed multidimensional cooperation with leading Chinese partners. As a caring corporate citizen, we often provide support to help communities tackle some of the tough issues they face today and in the future. CHD is a disease frequently encountered amongst newborn babies, putting severe emotional and financial burdens on the children’s families. 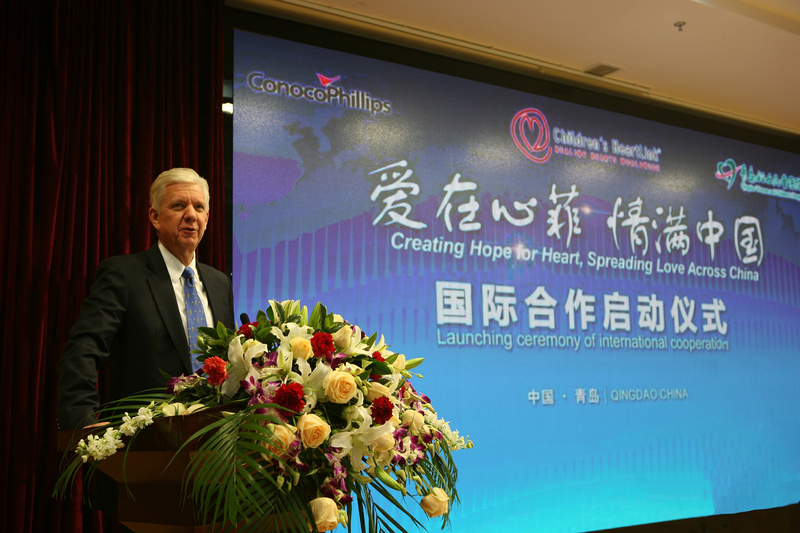 COPC has a 10-year history of helping children across China who suffer from CHD, having helped more than 450 sick children receive treatment to date. “Through our alliance with CHL, over the past four years the program has been implemented at both West China Hospital, to support the Southwest China region, and at Tianjin TEDA International Cardiovascular Hospital, to support the North China region. 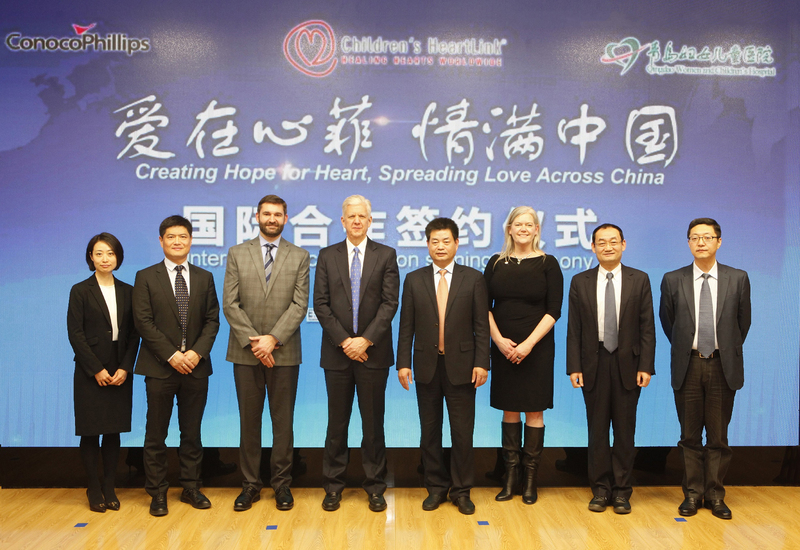 This year, the program will be expanded to Qingdao, benefiting East China in a sustainable way by enhancing the hospital’s capacity to ensure more children with illnesses receive quality treatment and can embrace a brighter future.” said Wheeler. In addition to providing support to China’s healthcare challenges, COPC is taking on the tough issues facing China today—from the conservation of nature in diversified areas to education advocacy for underserved communities; and from healthcare improvement to disaster rehabilitation. Since 2001, COPC has donated and invested millions of dollars in CSR in China, benefiting thousands of people and families throughout the country. Since 1969 CHL has been dedicated to caring for children with heart disease. CHL invests in long-term, multi-phase partnerships to ensure greater access to pediatric cardiac care and currently works in Brazil, China, India, Malaysia and Vietnam. Thanks to an expanding team of medical volunteers, over 5,000 local doctors, nurses and technicians are now more equipped to care for children with heart disease. On an annual basis, over 96,000 children receive care at CHL’s partner hospitals and programs around the world. CHL’s goal is to develop 50 CHL Centers of Excellence by 2030. For more information, please visit http://www.childrensheartlink.org/.